While much of Kyrgyzstan is covered in beautiful mountains, pastures, and canyons, the Issyk-Kul region offers visitors a glimpse at many of the country’s most amazing landscapes. Surrounding one of the world’s largest landlocked lakes, Issyk-Kul is a setting that boasts amazing views, fascinating history, and activities of all kinds. There’s *literally* something for everyone here! I spent over two weeks in Issyk-Kul in search of the best sights, hikes, and places to visit, and BOY was I shocked about just how gorgeous and serene the entire area is. It’s a hiker’s mecca, sure, but it’s also pretty amazing for people who simply want to learn about the semi-nomadic culture and lifestyle of the people here. If you’re short on time and want to see the best Kyrgyzstan has to offer, pack up your bags ASAP and head for some of these stunning destinations around Lake Issyk-Kul. 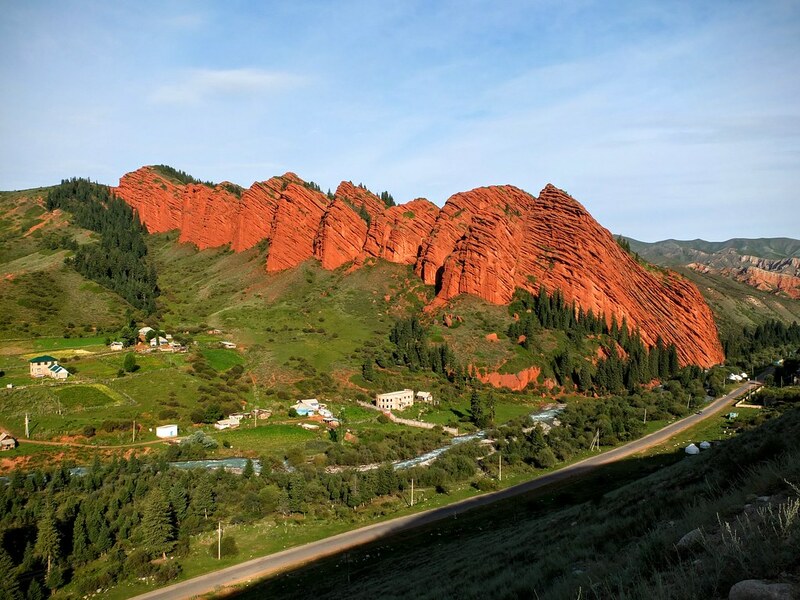 Cholpon-Ata is one of the only true “vacation” spots in Kyrgyzstan, where there are full-service resorts that offer beachside access to Issyk-Kul. Full of jolly Russian tourists and weekenders from Bishkek, Cholpon-Ata is a place where you can kick back and relax in some fairly nice Western digs. You can take a day or two here to swim in the water, sunbathe, or marvel at the mountaintops to the north. Home to the hippodrome of the increasingly famous World Nomad Games, Cholpon-Ata also offers access to some incredible seasonal events. Not only did the first three episodes of the Games take place here, but the Hippodrome is also open to visitors even when the games aren’t going on. While many visitors use Karakol as a base for treks in the surrounding region, the city itself has a ton to offer for virtually every kind of traveler (even the non-trekkers). For architecture buffs, there’s an old Orthodox church and a Dungan mosque to explore. Foodies will enjoy city-wide food tours, food making classes, bread making demonstrations, and Dungan traditional dinners to enjoy. History lovers can explore the old antique shop and the local museum, which boasts not only historic photos and artifacts, but also an impressive (and slightly strange) taxidermy collection. There are also plenty of wonderful day trips around Karakol to explore as well! Although this trek is located in the Karakol vicinity, it deserves its own recognition as one of Kyrgyzstan’s most epic trails. Ala Kul is a stunning high-altitude glacial lake, and nearby Altyn Arashan is a valley that offers hot springs for your subsequent sore legs. Most trekkers opt to take a 3-day (2-night) trek to Ala Kul and Altyn Arashan, spending one night in each. 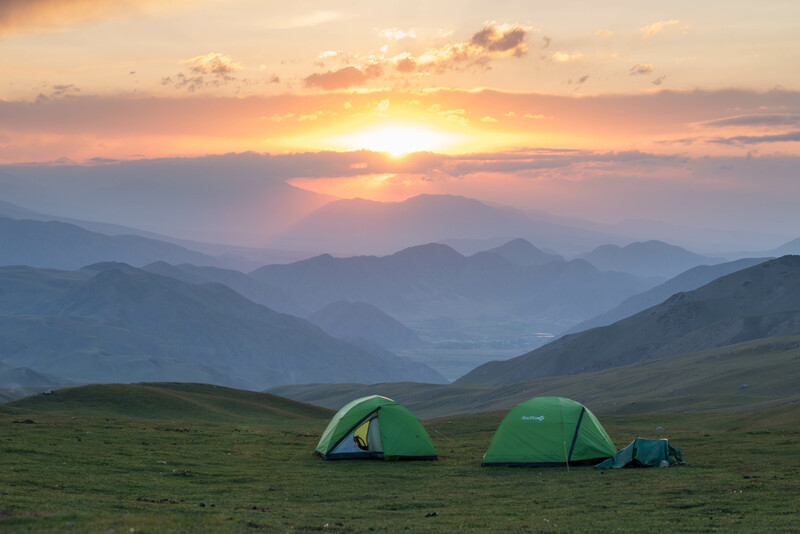 One of the best things about the Ala Kul trek is, unlike most other treks in Kyrgyzstan, you don’t need to carry any gear, as there are camps set up near Ala Kul and Altyn Arashan that welcome visitors and supply sleeping bags and meals for a reasonable price. I didn’t personally do the full trek to Ala Kul, I only hiked to Altyn Arashan overnight. However, my friends at Travels of a Bookpacker wrote a helpful guide for anyone who wants to take on this challenging adventure! If you’re still itching to trek after Ala Kul and Altyn Arashan, there area a variety of other treks you can do in the area. These treks are a little less popular than Ala Kul, so they typically require that you bring your own tent, sleeping bag, food, and other necessary gear. One of the most well known is the Archa Tor Pass trek, which passes through alpine valleys and glacial passes. Some people combine Archa Tor into a seven-day trek that extends from Kyzyl-Suu all the way to the canyons of Jeti Oguz (see below). Head to the Destination Karakol office to pick up a trekking map, and you can trek for days! Additionally, there are many multi-day treks (including day hikes that you can extend) available to those who want to see a little more of the region. One of the two most frequented canyons in the Issyk-Kul region, Jeti Oguz is a quick hop by marshrutka from Karakol town. Here, there’s a large rock formation called the Seven Bulls (“Jeti Oguz” translated), but there are also many more gems to explore if you have the time. Unfortunately, some marshrutka confusions made it impossible for me to explore this natural landmark, but the folks at The Sandy Feet wrote a really comprehensive guide on Jeti Oguz to help you all out who are curious about this beautiful canyon area. I’ll admit that I never heard of Kaji Say before I visited Issyk-Kul. At first glance, it’s a sleepy village on the south shore of Issyk-Kul that, on the outside, may seem like it doesn’t have too much going on. However, a closer look reveals one interesting (albeit strange) attraction: a large, two-story art museum called the Shygaev Museum of Modern Art. There was a famous, rich art collector originally from Kaji Say who decided to build a home for his collection right there in his hometown. Now, visitors can actually see it during business hours. However, I strongly recommend calling ahead to make sure they’ll be welcoming guests when you arrive. The museum’s phone number is +996 555 510 483 and their email is shygaevmuseum@gmail.com. Of all of the attractions in the South Shore of Issyk-Kul, this may be my favorite. Tucked behind rolling red hills and desert dust lies a beautiful and stark canyon called Skazka Canyon. Steep paths wind through spiked rock formations and ridges, and the surrounding area is a burst of color for the senses. If you have the time, you could definitely spend the better part of a day here simply wandering around the various topography of the area. Known unofficially as the “yurt village,” Kyzyl-Tuu is an important town for one of Kyrgyzstan’s most iconic aspects: the yurt. Here, you can see yurt building demonstrations, but if you ask around, you can also enter the workshops where they actually make the yurts. It’s a really cool and interesting process for one of the most important tools used by Kyrgyz shepherds. One of the dreamiest little yurt camps in all of Issyk-Kul is located in Tong, on the South Shore. It’s called Bel-Tam, and it’s perfect for people who want a “beach vacation” in the middle of a mountainous paradise! There are a handful of cozy yurts located right on the shore, and their beach offers opportunities for a swim on a warm summer’s day. My personal favorite stop on any Issyk-Kul itinerary is bustling Bokonbaevo, or rather, the areas surrounding this town on the lake’s south shore. There are a variety of day hikes, multi-day treks, horse treks, and cultural adventures to enjoy here. The Panorama Trek and Keregetash Trek are two of the most beautiful trails, and can be done by foot or by horse over the course of 4 days. Additionally, the Shatyly Overlook hike is a short but stunning hike that’s especially wonderful in the early morning hours. If hiking isn’t your thing, you can also organize or join traditional eagle hunting, or salburun, demonstrations through the local tourism board, Destination South Shore.